"An apostle, a teacher, must be bread: living bread, always served to his students, and to everyone else. The young, those with whom we work, our families, need to live the best life, God’s life, and for that reason to eat. There are moments reserved for education in the faith: catechesis, retreats, celebrations. All of that is the choice food. "But the daily bread -- not gourmet, but home-made bread and family bread, the kind that is partly wasted because no one ever misses it -- that is you. Isn’t that easy? Yes and no. Because for that role, you have to be another Christ; you have to be assimilated into him, configured into him, to be ready to serve him, good for all service. . . . That is how someone becomes good bread." French original from the website of the Community of St. Francis Xavier. “Do you believe in God the Father, the Son, the Holy Spirit? But these three phrases, too, are an expression—and Jesus Christ provides the proof of this—of the fact that the one God is, in his essence, love and surrender. Jesus knows, and acknowledges, himself to be the Word, Son, expression, and self-surrender—bearing witness to itself in love—of that Origin prior to which no existence is thinkable and which he calls the “Father,” who loves him and whom he loves in a common, divine Spirit of love, a Spirit whom he bestows upon us so that we can be drawn into this abyss of love (vast beyond measure) and thus comprehend something of its superabundance: “to know the love which surpasses knowledge” (Eph 3:19). "But since no relation can be affirmed of one subject alone, inasmuch as a predicate wanting relation is a predicate of substance, the manifoldness of the category of relation, Trinity is secured through the category of relation, and the Unity is maintained through the fact that there is no difference of substance, or operation, or generally of any substantial predicate. So then, the divine substance preserves the Unity, the divine relations bring about the Trinity. Hence only terms belonging to relation may be applied singly to Each. For the Father is not the same as the Son, nor is either of Them the same as the Holy Spirit. Yet Father, Son, and Holy Spirit are each the same God, the same in justice, in goodness, in greatness, and in everything that can he predicated of substance. One must not forget that predicates of relativity do not always involve relation to something other than the subject, as slave involves master, where the two terms are different. For equals are equal, like are like, identicals are identical, each with other, and the relation of Father to Son, and of both to Holy Spirit is a relation of identicals. A relation of this kind is not to be found in created things, but that is because of the difference which we know attaches to transient objects. We must not in speaking of God let imagination lead us astray; we must let the Faculty of pure Knowledge lift us up and teach us to know all things as far as they may be known." a Trinity of the Father and the Son and the Holy Spirit." 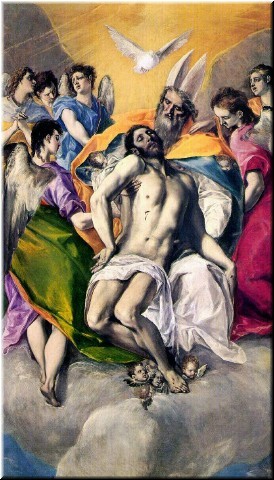 Picture: El Greco's painting, "The Trinity," which is in the Museo Nacional del Prado, Madrid. Asia News has posted its article on the Holy Father's Trinity Sunday Angelus message. 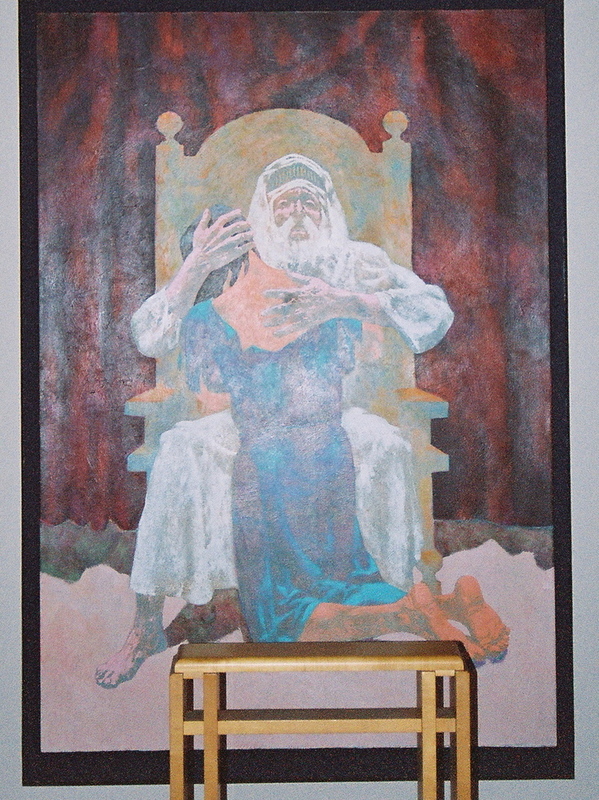 In it, the Holy Father is quoted as saying that "thanks to the Holy Spirit, who leads to understanding of the words of Jesus and guides one into all the truth (cfr Jn 14:26; 16:13), believers may know, so to speak, the intimacy of God himself, discovering that He is not infinite solitude but communion of light and love, life given and received in an eternal dialogue between Father and Son in the Holy Spirit – Lover, Loved One, and Love, to echo St Augustine." The ZENIT translation of the entire message is here. The Vatican translation is also available. The Archbishop of Canterbury's website has the full text ofCardinal Kasper's address on women bishops as well as Archbishop Rowan Williams' response. In that address, Cardinal Kasper mentioned the ordination of women priests as well as the consecration of women bishops, an issue presently being considered by the Church of England. "Doubtless, historically conditioned views at times had some influence on this tradition. There are some arguments belonging to the past that we do not reiterate today. We should of course be aware that our contemporary views are also historically contingent in many respects, and that presumably only future centuries will be able to measure just how greatly we have been conditioned by our times; they will presumably chuckle over many things which we take for granted today, just as we do over many ideas of the ancient or medieval world. On the other hand, it can be academically demonstrated that the rejection of the ordination of women within the tradition was not predicated on contemporary concepts alone but in essence on theological arguments. Therefore it should not be assumed that the Catholic Church will one day revise its current position. The Catholic Church is convinced that she has no right to do so. Cardinal Kasper's address with Rowan Williams' response is posted on the Archbishop of Canterbury website. It contains a substantial theological discussion of the role of a bishop in Scripture and in the writings of the Church Fathers, especially St. Cyprian of Carthage, and of how that view is expressed in the present day Church. He also mentioned that past discussions over changing the Catholic position on the nullity of Anglican orders (which dates back to 1896) had cooled as a result of the increasing ordination of Anglican women. With regard to that issue, as one of several, it is bishops who ordain priests, and the consecration of female bishops creates a situation in which the validity of some male priests’ ordination depends upon the validity of the bishopric of the female bishop who ordained them. It creates a situation in which it is increasingly difficult to judge the validity of orders, even if the Church decided to revise its view of Anglican orders as a whole. In addition to that, the movement toward more female priests and bishops shows that the Anglican Communion, as a whole, is moving in a direction away from unity with the Catholic Church on essential issues, and not toward it. "But we do now receive a certain portion of His Spirit"
"But we do now receive a certain portion of His Spirit, tending towards perfection, and preparing us for incorruption, being little by little accustomed to receive and bear God; which also the apostle terms "an earnest," that is, a part of the honour which has been promised us by God, where he says in the Epistle to the Ephesians, "In which ye also, having heard the word of truth, the Gospel of your salvation, believing in which we have been sealed with the Holy Spirit of promise, which is the earnest of our inheritance.” This earnest, therefore, thus dwelling in us, renders us spiritual even now, and the mortal is swallowed up by immortality. "For ye," he declares, "are not in the flesh, but in the Spirit, if so be that the Spirit of God dwell in you.” This, however does not take place by a casting away of the flesh, but by the impartation of the Spirit. For those to whom he was writing were not without flesh, but they were those who had received the Spirit of God, "by which we cry, Abba, Father.” If therefore, at the present time, having the earnest, we do cry, "Abba, Father," what shall it be when, on rising again, we behold Him face to face; when all the members shall burst out into a continuous hymn of triumph, glorifying Him who raised them from the dead, and gave the gift of eternal life? For if the earnest, gathering man into itself, does even now cause him to cry, "Abba, Father," what shall the complete grace of the Spirit effect, which shall be given to men by God? It will render us like unto Him, and accomplish the will of the Father; for it shall make man after the image and likeness of God." - Irenaeus, Against Heresies (a Refutation and Subversion of Knowledge Falsely so Called), 180-185 A.D., Book V, Chapter VIII, paragraph 1, from The Early Church Fathers: Anti-Nicene Fathers, Vol I, from Christian Classics Ethereal Library. "Through apostolic succession, then, 'it is still Christ who reaches us: in the words of the apostles and their successors, it is He who speaks to us; through their hands, it is He who acts in the Sacraments; in their gaze, it is his gaze that is turned on us and makes us feel loved, welcomed in the heart of God'." "Irenaeus points in particular to the Church of Rome, founded by the Apostles Peter and Paul. The succession of bishops in this Church can be seen as the sure sign and criterion of the unbroken transmission of the apostolic faith. Consequently, he says, every Church throughout the world must be in accord with the Roman Church ["Adversus Haereses" III, 3, 2]." Asia News has posted its article on Pope Benedict XVI's message at today's General Audience here. In today's message, the Pope remembered all of those who have suffered as a result of the Chernobyl nuclear disaster 20 years ago today. In his catechesis, he spoke of the meaning of the communion of the saints - past, present, future, and universal - and the meaning of Church Tradition. "This permanent actualization of the active presence of the Lord Jesus in his people, realized by the Holy Spirit and expressed in the Church through the apostolic ministry and fraternal communion, is what is understood by the term Tradition in the theological sense: It is not the mere material transmission of what was given at the beginning to the apostles, but the efficacious presence of the Lord Jesus, crucified and risen, which accompanies and guides in the Spirit the community gathered by him." The P.I.M.E. Asia News - Italy translation is usually the first online. It may differ from the ZENIT and Vatican translations that are available later. I regularly add links to all three as they become available. Meanwhile, anyone is welcome to post a link in the comments here for other articles or translations, as Clare did last week. St. Anselm: "The Rational Creature Was Created for This Purpose"
"IT seems to follow, then, that the rational creature ought to devote itself to nothing so earnestly as to the expression, through voluntary performance, of this image which is impressed on it through a natural potency. For, not only does it owe its very existence to its creator; but the fact that it is known to have no power so important as that of remembering, and conceiving of, and loving, the supreme good, proves that it ought to wish nothing else so especially. "For who can deny that whatever within the scope one’s power is better, ought to prevail with the will? For, to the rational nature rationality is the same with the ability to distinguish the just from the not‑just, the true from the not‑true, the good from the not‑good, the greater good from the lesser; but this power is altogether useless to it, and superfluous, unless what it distinguishes it loves or condemns, in accordance with the judgment of true discernment. "From this, then, it seems clear enough that every rational being exists for this purpose, that according as, on the grounds of discernment, it judges a thing to be more or less good, or not good, so it may love that thing in greater or less degree, or reject it. "It is, therefore, most obvious that the rational creature was created for this purpose, that it might love the supreme Being above all other goods, as this Being is itself the supreme good; nay, that it might love nothing except it, unless because of it; since that Being is good through itself, and nothing else is good except through it. "But the rational being cannot love this Being, unless it has devoted itself to remembering and conceiving of it. It is clear, then, that the rational creature ought to devote its whole ability and will to remembering, and conceiving of, and loving, the supreme good, for which end it recognises that it has its very existence." - St. Anselm of Canterbury, Monologium, Chapter LXVIII, Christian Classics Ethereal Library. Tom Kreitzberg at Disputations has provided the outline he created for a parish discussion of Deus Caritas Est, along with more thoughts on God's simplicity and on God as love, all here. The outline includes items from St. Augustine and from the Catechism, as well as suggested questions for discussion. There is also an interesting discussion on the subject going on there between Tom and Steven Riddle of Flos Carmelli.